Get ready to ring in the season with a full-length adventure straight from the heart of the Hundred Acre Wood. Join Pooh, Tigger, Eeyore, Roo and the whole gang in Winnie The Pooh: A Very Merry Pooh Year – now on Blu-ray™ and Digital Copy for the first time. Newly re-mastered in digital high definition, this sparkling holiday classic is an inspiring celebration of friendship. WE ARE THE FASTEST SHIPPERS IN THE WORLD! max e’ un tassista. vincent e’ un killer di professione giunto a los angeles per uccidere cinque testimoni chiave di un’inchiesta che coinvolge un’organizzazione di narcotrafficanti. a causa di circostanze impreviste, vincent prende in ostaggio max, mentre fbi e’ sulle loro tracce. 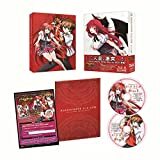 2nd season of High School DxD limited edition Blu Ray/ DVD set.